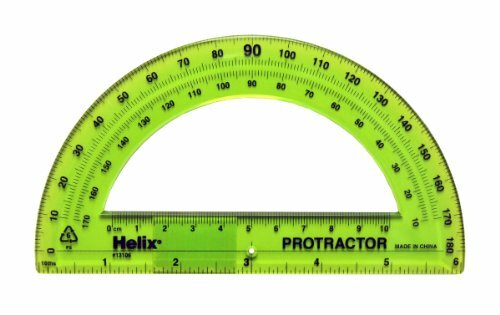 Helix 180° Standard Protractor, 6 inch/15cm, Clear (13106) is currently selling at $4.21, which is its normal price. It has a lowest price of $3.80 and is selling within its usual range. Price volatility is 0.74% (meaning it does not change often), so the price should stay low for a while. Until then this is a recommended 'good deal'. 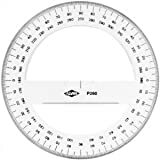 Compare the current price, savings (in dollars & percent) and Buy Ratings for the top Protractors that are closely related to Helix 180° Standard Protractor, 6 inch/15cm, Clear (13106). Here is how Helix 180° Standard Protractor, 6 inch/15cm, Clear (13106) compares with other leading Protractors. 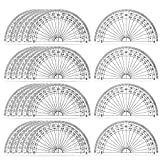 180 Degree plastic 6" / 15cm protractor with beveled edges, 6" / 10cm ruler and centering hole built in. Ideal for school use! FeaturesTransparent plastic for easy measuringGraduated in both imperial and metricCustomer will receive one in any of the following colors: Blue, Yellow, Green, Orange or Red. Color is random and cannot be chosen at this time.Transparent plastic for easy measuring ^Graduated in both imperial and metric ^Customer will receive one in any of the following colors: Blue, Yellow, Green, Orange or Red. Color is random and cannot be chosen at this time.